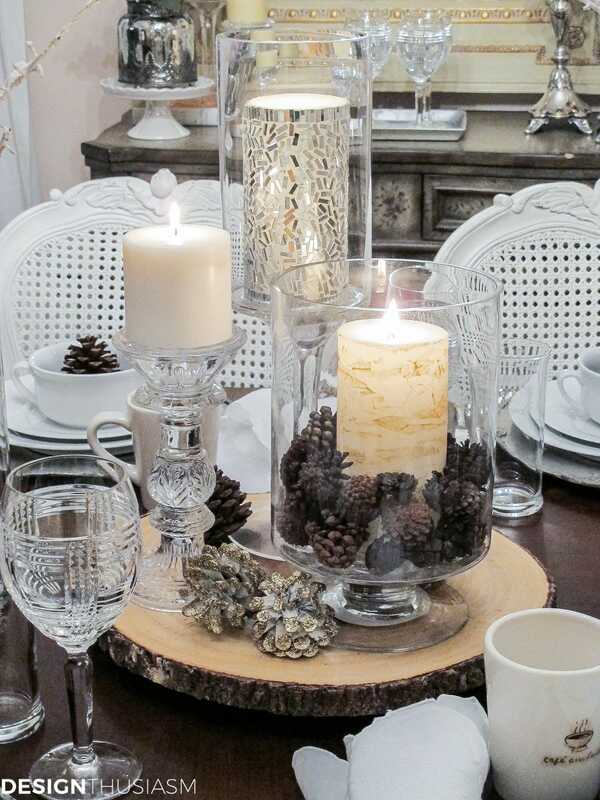 In this post: Rustic and elegant winter decorations add seasonal flavor to a white tablescape, uplifting the mood for a winter celebration. To say I’m not a huge fan of winter is a vast understatement. I am one of those people very much affected by the weather and the bleak perspective winter sometimes offers very much makes me want to hibernate. For that reason, it’s the perfect time to set a table in celebration of the season to make my peace with it and find the joys in winter. 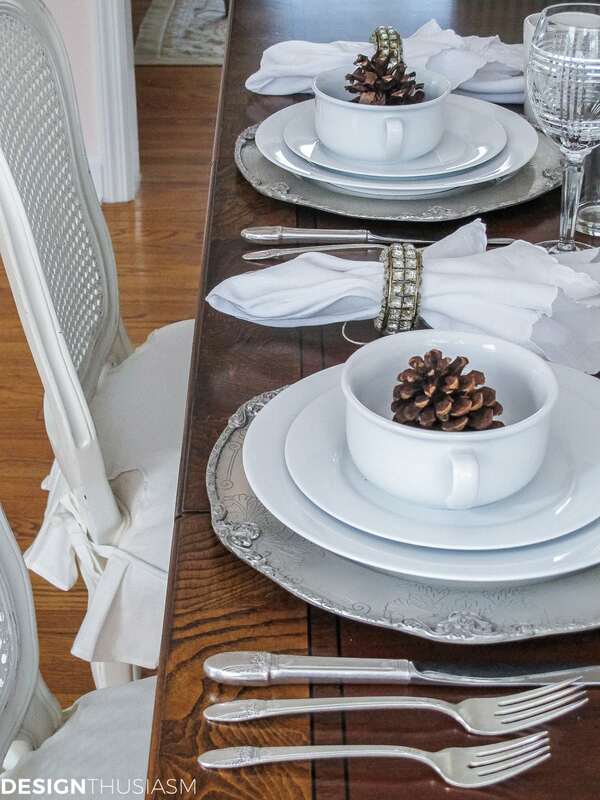 I love the freshness of a white tablescape, so that’s a natural place to start. 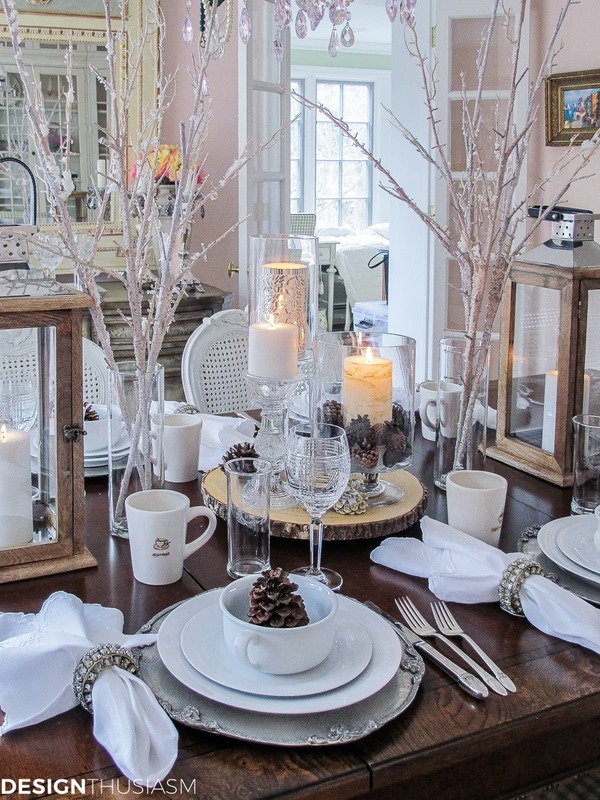 Here, winter decorations add seasonal flavor to a white table setting. 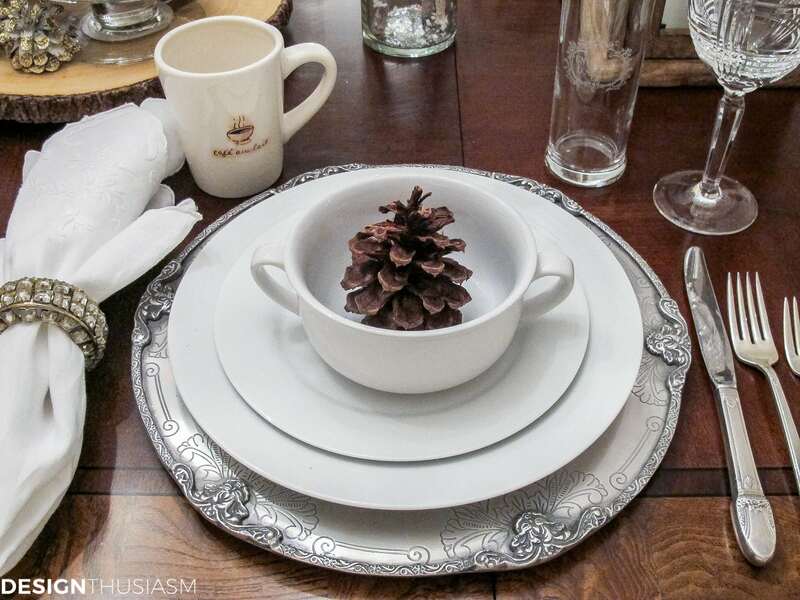 In setting my table, I first thought about my overall design inspiration that you can find in this post, and then followed my key concepts, focusing on the clean crispness of mixed whites, the warmth added by candlelight and a nod to nature via woods, branches, bark and pinecones. 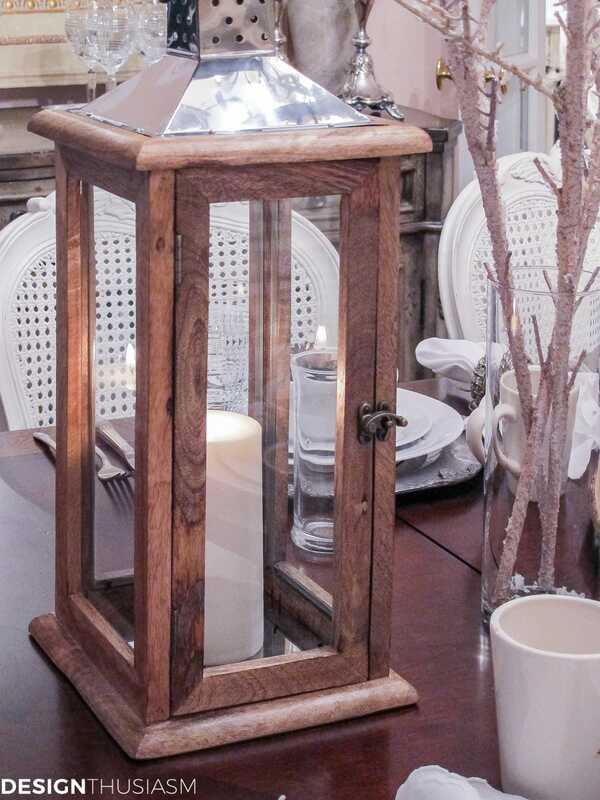 Rustic wooden lanterns provide a bold opportunity to add candlelight through pristine white candles tucked inside. 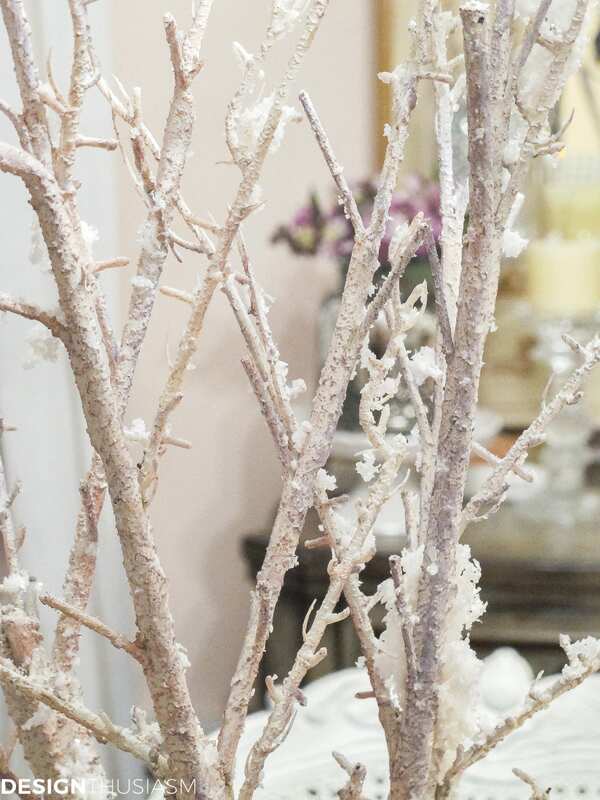 These bare white branches are dusted with faux snow and lend a lovely wintry note to the scene. The idea was to capture the beauty of the season on the table without any of the real chill that comes along with it. 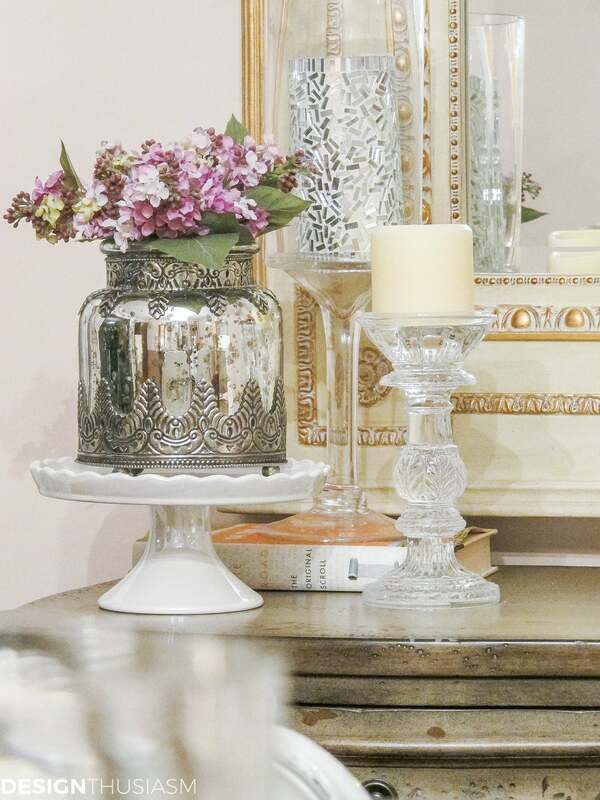 The nearly colorless palette extends to the sideboard, as well, where an iridescent white cake plate lifts a pewter vase and mixes with crystal and glass candle holders. 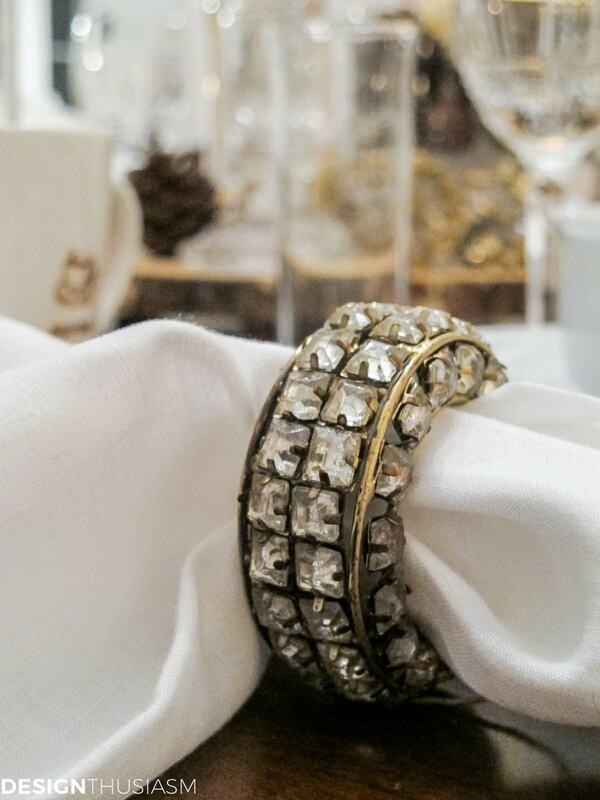 Cottony white napkins with tonal embroidery are corralled by these wonderful glimmery napkin rings. 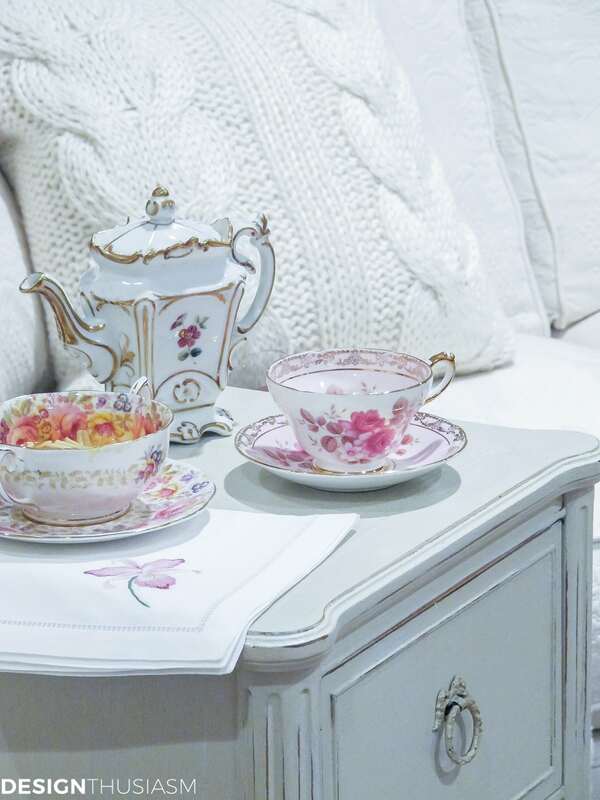 The white tableau is complemented by pretty cane back Shabby Chic chairs, with their white ruffled chair covers. 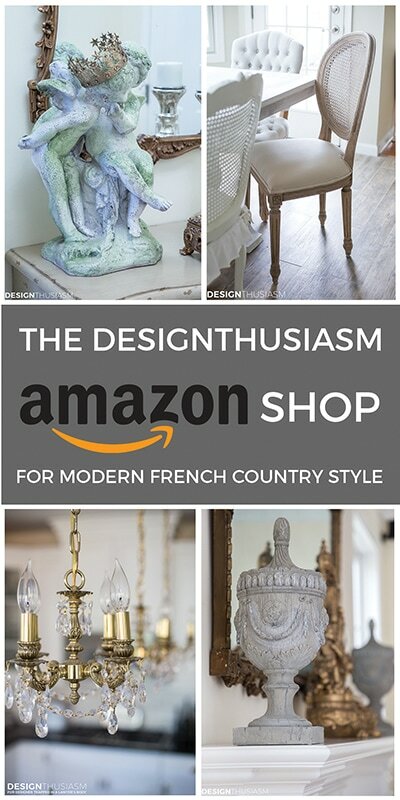 The crystal herringbone goblet sits next to a French water glass, mirroring the table’s thematic mix of strong and classic with light and feminine. 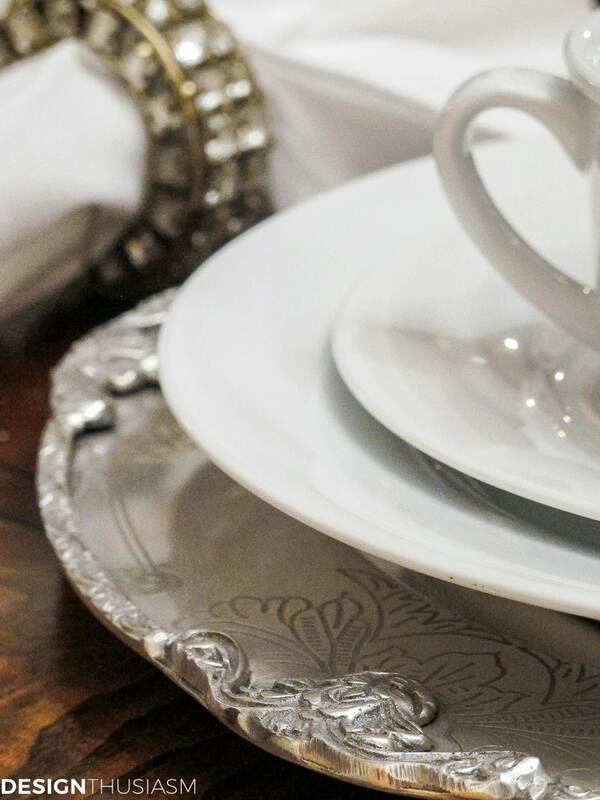 The silvery chargers have a decorative edging that offer a lovely backdrop to the clean lines of the simple plates. The brilliant light shining through the window reveals the the starkness of the whites balanced against the warm dark woods. Nothing says winter like two handled soup bowls waiting to be filled with a warm broth. Here they offer a sculptural note with large pine cones set inside them. 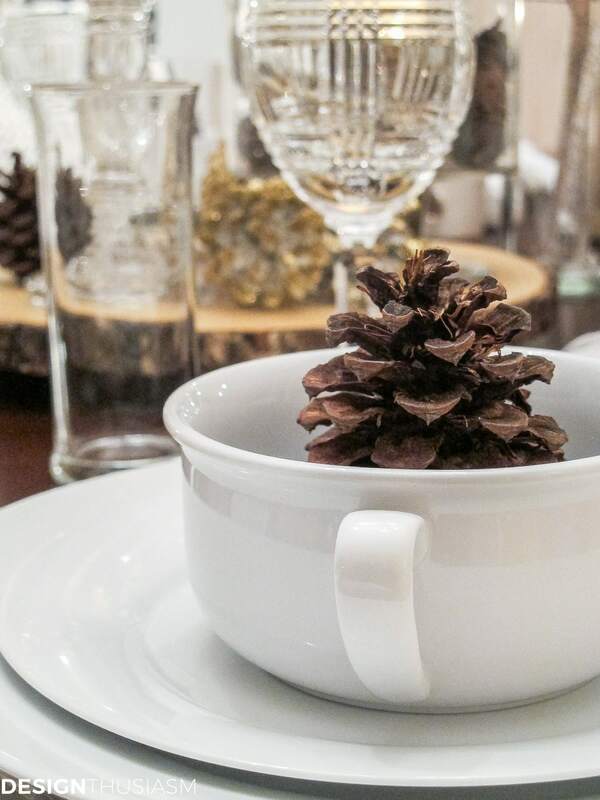 A bark server functions as the base of a woodsy centerpiece, where wintry candles are encircled by mini pine cones and gold flecked ones, as well. The vignette captures the essence of the tablescape, offering bits of nature served up amongst charming tabletop elements, all in the shadow of the warm glow of candlelight. Beautiful, beautiful, beautiful…loving all the white. 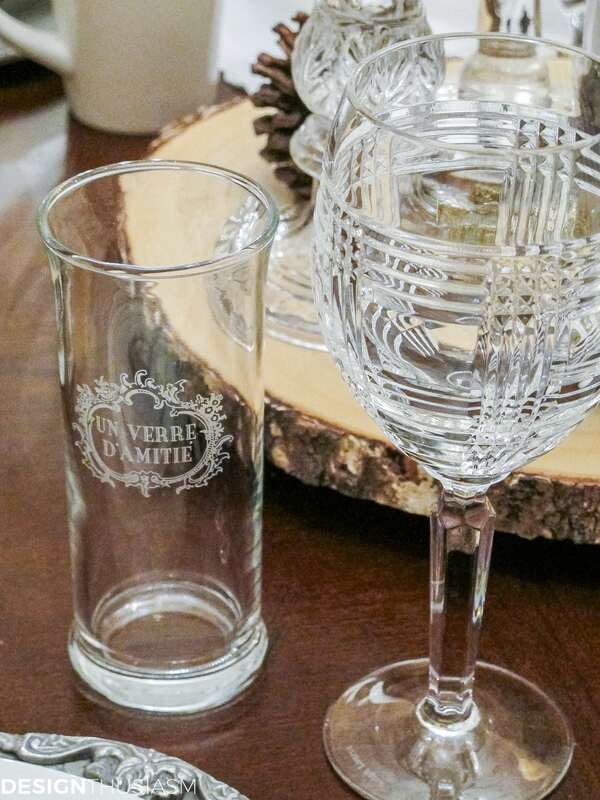 Those “glass of friendship” tumblers are wonderful! I would be happy to find some of those branches…they really make a statement. 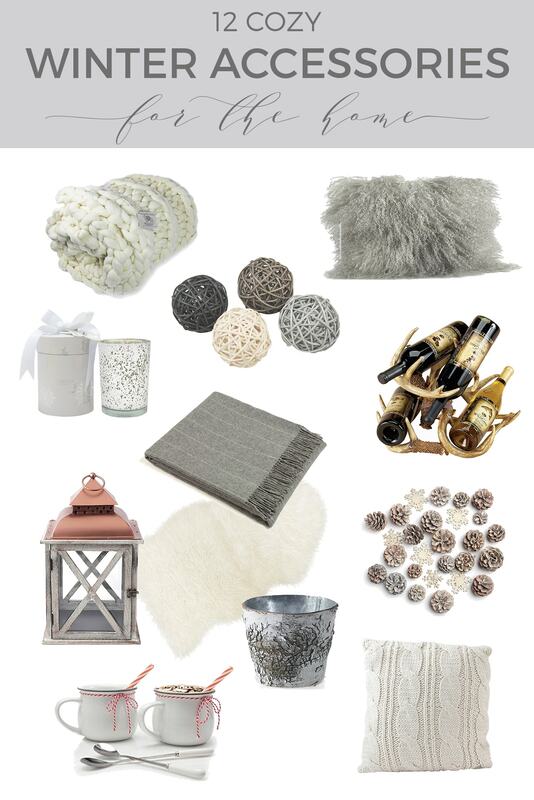 It’s so wintry, yet so cozy, too! So pretty! 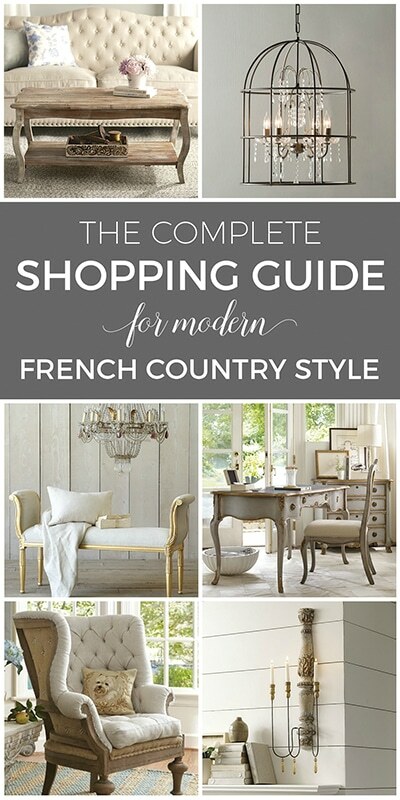 I have that very same table from Ethan Allen! Most of my furniture is from there. 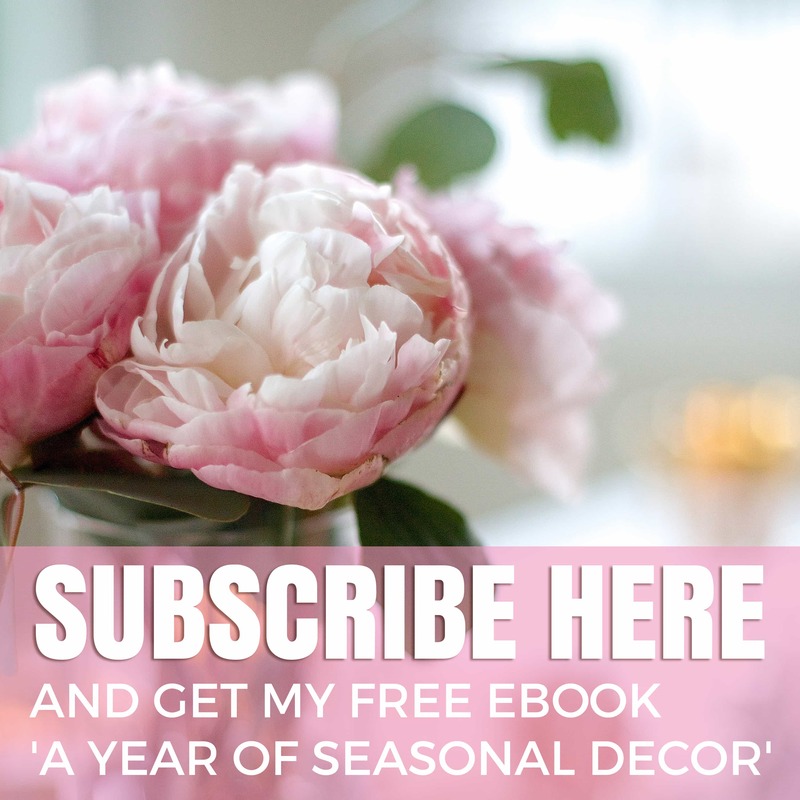 You have THE most beautiful home decor….. I’d love to hear your tips for accessible storage and organizing things that don’t get used on a daily basis. 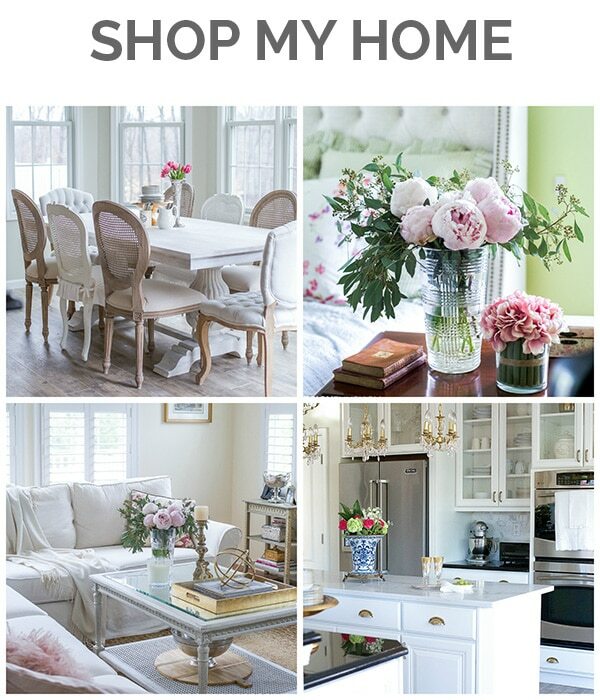 I recently found your blog and am so inspired to up the ante on ‘pretty” in our home. Love this winterscape…so….so…. much! What a lovely lovely comment!! It means so much to me… 🙂 I am definitely planning to do a storage and organizing post, as I’m generally the most freakishly organized person on earth, but with all I purchased recently for the blog, I’ve been wanting to set up a new storage system for these new items. I’ve got the closet with shelves targets for this, but I need to do the work or setting it up first. Be on the lookout. Thanks so much for visiting and taking the time to comment!! Thank you so much, Susie! Such a nice compliment… 🙂 The branches actually came with the snow on them. In fact, it kept falling off every time I moved them. One of these days I hope to put a full tour up on the blog. Looks beautiful! I love your plate trivets. 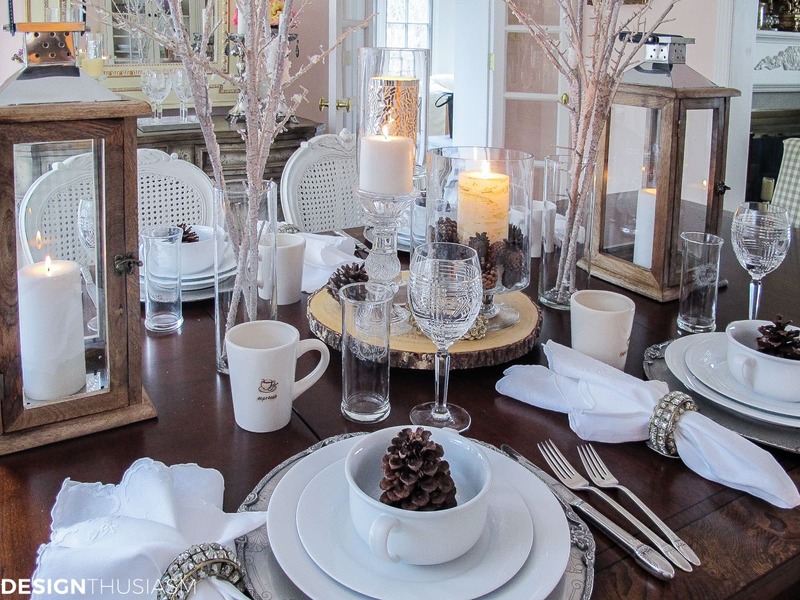 Gorgeous tablescape and your photography is amazing! 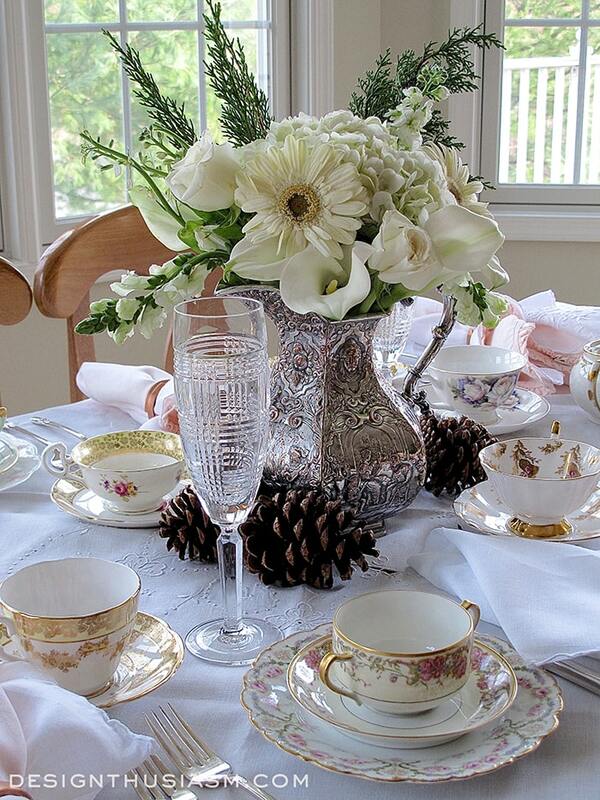 I could look at these pics all day never mind sitting down to eat at the fabulous table setting! Just beautiful, so crisp and wintry…love it! Thank you Cindy! I truly do hate winter so I certainly need to make it as pleasant as possible… lol! The snow flocked trees branches really make a perfect wintery woodland setting. The crystal and silver create the perfect cool feeling! Love the bark server with the candles. I don’t enjoy winter either but somehow I feel I’d miss the seasonal change if I didn’t have it. Thanks, Liz! I completely agree about the season changes, but I think I would be good with just Spring, Summer and Fall. Maybe it should be Spring, Summer, Fall and Vacation! 😉 Thanks for visiting! What a stunning table! It really does give Winter a warm glow. Love those chargers and the branches are just beautiful! Thanks for sharing with SYC. Thanks, Jann! And it’s my pleasure to share with your wonderful link up. Thanks for hosting!! This is so pretty! 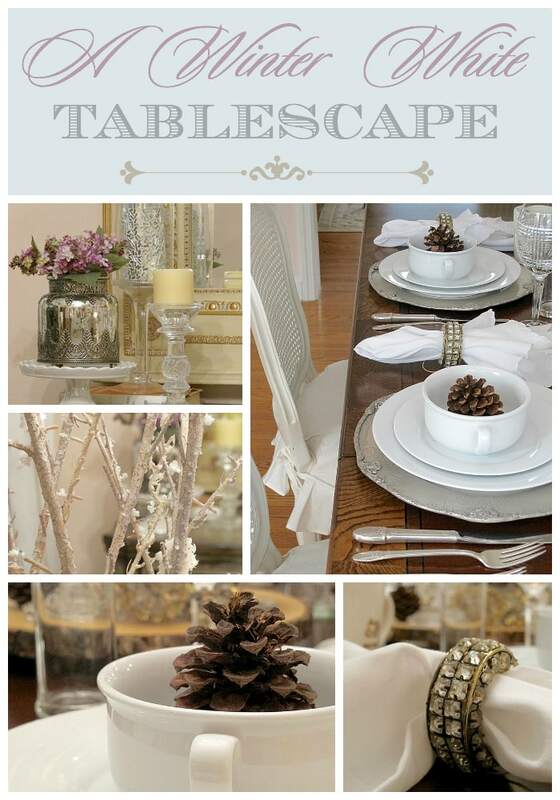 I’ll be featuring your tablescape at The Scoop this coming Monday night. Thank you for linking up! 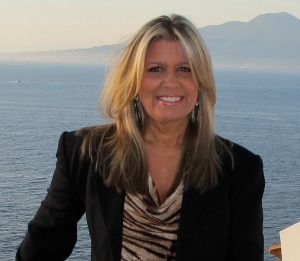 Suzy, I can’t thank you enough!! The scoop is always my best referrer and when I’m featured, even better… 🙂 Thanks for hosting! I always love participating. Thank you so much, Laura! After the blizzard we’re getting right now, I think I’ll be doing palm trees next week… 😉 Thanks for stopping by!